Mr. Riaz why is it that US and UK and western countries fund so many development projects in Pakistan whereas rich gcc muslim countries with surplus budgets hardly fund non arabic muslim countries? I am a muslim and I get this question asked a lot by non muslims because they think we hate the west which is not true at least in my case. Anon: "rich gcc muslim countries with surplus budgets hardly fund non arabic muslim countries?" No one advertizes the GCC assistance like the US or UK help which gets lots of coverage in western media. Pakistan is getting substantial help from Saudis and Emiratis for flood affectees. 1. Saudi Arabia is funding the local chapter of UNICEF to rebuild a massive water supply network in Pakistan devastated by ravaging floods at a cost of hundreds of millions of SRs, according to Arab News. 2. Seven UAE-funded hospitals and clinics are being built in Pakistan at a cost of nearly Dh63 million, according to UAE's National newspaper. You are mixing up solar panel systems with $15 solar panel lights. 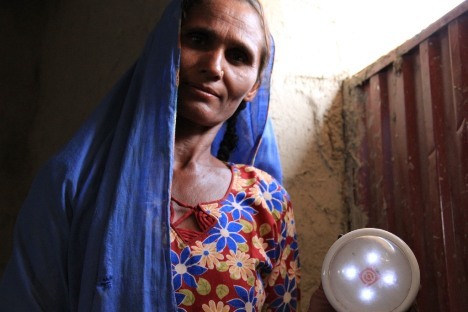 Home Depot sells 55 lumen solar lamps for $30 each (could equate to $15 in Pakistani market). In comparison, just imagine - a 40W lamp is about 450 lumen. Shams: "You are mixing up solar panel systems with $15 solar panel lights...."
Each solar light has a built-in solar panel which it uses to generate electricity to charge the batteries. The villagers in Pakistan are getting these for free from DfID funds. The value of these lights should not be measured in dollars but the significant positive impact they have on the lives of villagers. They reduce risk of fire from candles or kerosene lanterns, improve productivity and allow people to charge their cell phone batteries to keep in touch with their families and communities. The good news is that the cost of solar products is rapidly declining as the Chinese flood the market. Solar panels, solar heaters, and energy storage devices are all becoming more and more available and affordable, just as the cell phones have. I expect significant relief for energy starved Pakistanis. Two Mega project each 3MW on two hospitals"
Solar lights are a much bigger deal in terms of enabling Pakistan's vast village population that has little or no electricity. The good news is that the cost of solar products is rapidly declining as the Chinese flood the market. Solar panels, solar heaters, and energy storage devices are all becoming more and more available and affordable, just as the cell phones have. I expect significant relief for energy starved Pakistanis from a solar revolution. Using solar lights for traffic lamp posts, or at home is not the same as using it on an institutional level. I have 55 lumen solar lights in my backyard but I do not claim myself to be solar-lighter. In fact I am opposing solar on the roof intiative of CSI at gubernatorial level. Just so you know, T. Boone Pickens has shut off his support for wind and solar - after wasting hundreds of millions of dollars on wind farm in Gulf of Mexico and elsewhere. His take - forget solar and wind, and go for natural gas. Shams: "Just so you know, T. Boone Pickens has shut off his support for wind and solar - after wasting hundreds of millions of dollars on wind farm in Gulf of Mexico and elsewhere. His take - forget solar and wind, and go for natural gas"
T. Boone Pickens knows nothing about the village life in developing nations where more than 40% of the people lack electricity. His pursuit of profits and his opinions are in North American context. He wants to exploit abundant shale gas resources discovered more recently. Pakistan, too, has lots of shale gas and other domestic energy resources like coal. But Pakistani government and public utilities have failed the rural people in Pakistan. Left to them, the poor villagers, especially those living far away from the electricity grid or the gas pipelines, will be waiting for ever to get their basic energy needs met. Ubiquity of cheap solar products, just like cheap and ubiquitous cell phones, are the right answer in Pakistani villagers to help transform their lives in a reasonable time-frame. The villagers do not pay for the solar lighting and if it was not for free, they would not have got it installed. The ones you're talking about are UK funded. One can say that solar lighting is a better way of dispensing charity to poor villagers than Benazir Income Support Program or similar government sponsored schemes. I think the issue to address in your blog is that government poverty alleviation programs should spend on solar lighting instead of dishing out money which is eventually wasted or ends up in corruption. I cannot see the prospect of solar lighting development as a sustainable business proposition in Pakistan (or anywhere) in the near future, unless solar panels become dirt cheap or oil & gas reach extinction levels and become prohibitively expensive. In Europe and America, solar energy is highly subsidized. A few years ago, the big western corp dismissed the poor nations as a market for their products. All that changed with the massive uptake of cell phones by the poor in South Asia and Africa. This has brought about a dramatic change in the thinking of big corp who now are developing and marketing actively to the "bottom of the pyramid" market. There's even be an HBS case study on it. As to the pricing of the solar, the cost and price curves are following Moore's Law....it's getting significantly cheaper and more capable each year....it came down 27% year over year in India. Last month, NY Times reported that the Indian government held its second auction to determine the price at which its state-owned power trading company — NTPC Vidyut Vyapar Nigam — would buy solar-generated electricity for the national grid. The average winning bid was 8.77 rupees (16.5 cents) per kilowatt hour. The German example is pretty bad though. Germany's 23GW installed capacity is mostly comprised of rooftops though large plants are also in place. The feed-in-tariff for rooftoppers costs ONE billion euros per month to subsidize. So once again, I must say - forget it. Just six months ago I figured that the place where 2 KW small solar systems are deployable were Pakistan's remote areas. Since then, technology has came up with 16-sq-inch (4x4 inch) solar panels that power individual 20W LED light bulbs pushing out 500 lumens, equal to a 70W incandescent bulb. The new LED LCD 73 inch TV that I just bought consumes only 120W, and a fridge that I bought for my garage is running at 210watts. So yes - some villagers may run a light or two, a TV and a fridge on solar, using individual solar panels. But the moment you start shipping electrical power from the panel to a distance, all hell breaks loose, since my new toaster still runs at 1500 watts. Solar shall remain good for trinkets for a long time, not for large power plants. Au contraire, Pakistan has the largest number of transportation vehicles on CNG. It took Pakistan nearly 30 years to develop its CNG infrastructure at a cost of $10 billion (http://naqvigroup.com/transglobeshipping/exipromocng.html). Look at the Indian solar example which is more relevant and recent, not the German example which was done much earlier to encourage solar development many years ago. The solar economics are changing rapidly with the Chinese entry in a big way. If "some villagers may run a light or two, a TV and a fridge on solar, using individual solar panels", that represents a huge improvement in their lives from the current situation, providing a huge impetus for human and economic development in Pakistan. There are thermodynamic (scientific) principles explaining that solar energy conversion to electricity has much lower efficiency compared to chemical, nuclear or mechanical energy conversion to electricity. It is not a matter of marketing strategy, social and economic issues only. Technological development is an important factor changing our lifestyles, but it follows scientific principles and not in violation. You cannot, therefore, extend the logic of cell phones and computer chip development to solar electricity; it will be very inaccurate. Suhail: "There are thermodynamic (scientific) principles explaining that solar energy conversion to electricity has much lower efficiency compared to chemical, nuclear or mechanical energy conversion to electricity....."
India is ramping up indeginous production in solar cells in a big way look up moser baer among tehrs. Anon: "India is ramping up indeginous production in solar cells in a big way look up moser baer among tehrs." Good for India. As of now, all solar panels in India are imported. Anon: "does pakistan have a similar plan or like cellphones is it an 'import from dear friend china' strategy again"
India, too, imports bulk of its cell phones from your "enemy China", running huge trade deficits. While no one is running over the other in pursuit of solar, a country as poor as Pakistan has already invested $10 billion in equipment for CNG use in transportation vehicles- all of which money is from investors and zero from the government. I do not know if the American public has invested as much in solar panels on rooftops which is all subsidy funded. I agree that 10 years from now solar will be cheaper and good for Pakistan. For now Sindh's Younus Dargha is right in pursuing 25000 MW from coal power and I will happily cozily wait for that day while my electrical heater runs on fossil fuels. Technological development is not taking place in solar alone; it is being done in power generation from fossil fuels also. Previously the energy efficiency using engines or boiler/turbines was around 25% only. Now it has gone up to over 45% and the trend will continue. The high temperature flue gases from engines are still more feasible to convert to usable energy than low temperature heat from sun. However, if fossil fuels become costly because of depleting reserves, or (more likely) their use is restricted through legislation for environmental reasons, then solar power will certainly take over. As Shams mentioned, we were discussing solar electricity as a business model but couldn't come up with a feasible one. I'll soon be starting another discussion with Shams for using solar energy for hot water generation which provides usable higher temperature heat with a 4-5 times higher energy efficiency than solar power generation. The hot water to be used in absorption type refrigeration systems for air-conditioning. In winters the same system (minus the chiller) is used for space heating. This seems more feasible in Pakistan compared to solar power generation. For the US similarly, where sunny conditions prevail and both cooling and heating required over the year (as in California), this will probably be a better use of solar energy compared to solar power generation. Shams can comment on this. The point to note is that use of solar energy does not only mean power generation. There are other alternatives more in line with thermodynamic principles. Even with the infrastructure, Pakistan is already suffering a serious CNG crisis. Regardless of conversion efficiency, fossil fuels like coal, oil or gas are not as abundant as the sun, particularly in places like sunny India and Pakistan. And villagers do not need much of an infrastructure to use solar. Anon: "nope it manufactures most of them at home/(it is a net exporter of mobile phones):"
Livemint you referred to is an old 2007 Gartner forecast, not actuals. The reality is that India imports most of its phones from China. Taiwanese manufacturer HTC, which makes phones in China, led the field in growth at 99.1% in India in 2011. Pakistan's geography is most conducive to exploitation of solar energy as it is 6th most fortunate country in the world in terms of solar irradiance and where sunshine availability is 8-10 hours per day over much of the plans of Sindh, Balochistan and Southern Punjab. Solar energy intensity in sunbelt of Pakistan is approximately 1,800-2,200 Kwh per square meter per day which is most favourable for exploitation of solar energy. Potential capacity for installation of solar photovoltaic power by some estimates is 1,600 GW, which is 40 times greater than present consumption. Based on range of currently possible conversion efficiencies in area of one sq km has potential to produce 40-55MW power and can generate revenue conservatively estimated at Rs 1 billion per month at current average tariffs of Rs 10 per Kw-hr. Since solar power is available only during times of sunshine, it can at most meet up to 30% of daily consumption without need for energy storage such as in underground salt deposits. Wasteland and desert of Thar, lower Sindh & Balochistan are prime contenders to establish large solar farms with capacities of generating more than 250 gigawatts electric power to meet energy shortfall over coming decades, says expert Samir Hoodbhoy who participated in technology breakthroughs in robotics systems, semi-conductors and first mobile cellular system developed. He directed creation of Central Design Bureau of Pakistan Steel Mills in 1988-92. Hydrokinetic and solar thermal are two most promising alternate renewable energy solutions that can be used to reduce Pakistan's rising $10 billion annual fuel imports and energy deficits and at same time preserve environment by not adding to hazards of increased carbon gases emissions caused by use of furnace oil and natural gas. Deserts of Tharparkar & Balochistan have potential for producing several hundreds of GWatts power. Alternate Energy Development Board AEDB says Nokundi in Chagai district is one of world's most ideal wind corridors where wind speed is almost constantly 12.5% higher than average required for energy generation. Other parts of wind corridor includes a 300-kilometre-long area with wide open spaces from Dalbandin to Taftan, a town on border of Iran, Gharo to Keti Bandar in Thatta district of Sindh province which is 60 km long and 170 km deep corridor and estimated to have a power generation potential of 50,000MW. Similar is case of Lasbela district of Balochistan province, where wind energy at sustainable speed, good for power generation is available with little variation in seasons (five meters per second in winter and eight meters per second in summer). Hoodbhoy says in Balochistan potential for wind generation is attractive, current unsettled political, socioeconomic conditions are disincentives for construction of large wind turbines and solar farms with capacities of 1MW. Under settled conditions, this region could easily become attractive carbon gas free energy producing center. Mini wind farming projects (1-50 kWatts) along with small solar farms scattered over remote inaccessible areas presents attractive proposition that will help mitigate localized needs of electricity for lighting, communications, pumping water with tube wells for irrigation, domestic consumption. Larger wind power and solar power farms with individual production capacity of 0.5-500 MW developed along wind corridors and desert hinterland of Balochistan, respectively, have capacity to radically alter socioeconomic plight of Pakistan by resuscitating agricultural and industrial sectors. sir, can u please highlight the fututre prospect of solar refrigeration in Pakistan? ?what are the plans and their implementations?? Established in 1990, Ghazi Fabrics International manufactures and exports yarns, including the Panther brand, to the Far East and European markets. Set up as the first composite unit of its kind and scale in the country, the Company's manufacturing units currently have an installed capacity of over 50,000 spindles ranking it among large spinning/weaving companies in the country. BRR: What are the major milestones for the Company? Kamran Arshad: In 1990, after acquiring land for setting up the facilities, we became the first company at that time to establish three textile mills in a single location simultaneously. Starting off with such a large base also brought along some teething concerns, as we did not have room to be able to learn from our mistakes before expanding. Partly as a result of this, we did not grow at the same rate as some of the other significant players. On the other hand, we are among very few companies that have never defaulted. We have always maintained good standing with all lenders and financial institutions and we are a very strong contributor to the national exchequer in the form of taxes. BRR: Has the Company considered coal based power generation? KA: As a matter of fact, we are considering that and what we have found is that coal based power generation is feasible, if there is sufficient steam utilisation. If that happens, the tariff is similar to that offered by SNGPL. In China, there has been a recent shift in government policy regarding coal based power plants. Earlier that government had been promoting the establishment of such power plants, but now after the construction of the Three Gorges Dam, the Chinese government has ordered that all coal based power plants with a generation capacity of fewer than 50 megawatts, should be shutdown within two years. As a consequence, these power plants are selling at half the price of a new plant. We believe there is an opportunity for Pakistan here and I am personally quite sure that some entrepreneurs will venture into bringing a power plant here from China. The composition of the coal produced in this country, be it from Thar or from Chakwal; is quite comparable to the Chinese variety so these power plants will require a few if any modifications. UMERKOT, Pakistan, Sept. 22 (News Lens Pakistan) -- Building roads, electrical grids and even schools can be so costly in Pakistan's Thar Desert, a remote area of scattered settlements, that they often just don't get done. But the one thing this arid region does have is plenty of sunny days. With that in mind, a collection of non-governmental organizations has joined the government to introduce solar power into the schools – only about 4 percent of which have electricity. So far, 14 green schools have been built, and eight more are planned. There is enough solar energy to run the fans and computers. Moreover, the students have been provided with rechargeable lights that can be charged during school and then can illuminate homes after sunset in the deep desert – ensuring they have light to do their homework. "Due to sandy tracks and far-flung areas, not having grid-connected electricity and resources, it was difficult to provide a better environment to children in these schools," Ali Akbar Rahimoo, executive director of the Association for Water, Applied Education and Renewable Energy, told News Lens Pakistan. "Solar-powered water pumps have also been installed on dug wells to haul water from the depth of 300 feet, which have provided water for sanitation, hygiene and growing trees," he said. "This model has proved a ray of hope for marginalized people that their children can get a quality education and pave the way for a better future." These green schools are also much cheaper, costing $1,000 to build compared to $7,000 for conventional buildings. The costs, so far, have been paid by local and international aid agencies. "This is an environment-friendly and sustainable model to educate children in remote areas in Thar, as well as other arid and semi-arid areas of Sindh, Balochistan and other provinces of Pakistan," Manoj Kumar, a project officer with AWARE, told News Lens Pakistan, adding that this is the first time many of these students have been inside a classroom. "Before, the government schools had no buildings, no classrooms and no toilets, especially for girls," he continued. "Summers and winter were hard on them." Sallah Dars of Tar Dos village praised the new schools for giving students their first glimpse of a computer and access to clean water. "It is like a miracle for poor parents," Dars told News Lens Pakistan. "There is massive opportunity for business," said Saad Ahmad, 26, chief executive of solar energy supplier Nizam Bijli, which has powered 1,300 homes since it started in 2016 and hopes to reach 1 million people by 2020. "There is room for many companies to make a difference in the lives of these communities."